Dean Street Press are reissuing a seminal history of wartime nursing, from the Crimea to World War II, making the work available digitally for the first time. 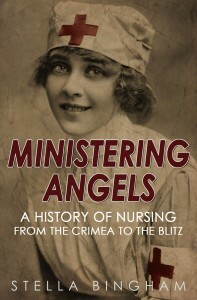 MINISTERING ANGELS: A HISTORY OF NURSING FROM THE CRIMEA TO THE BLITZ by Stella Bingham legantly traces the history of modern nursing, from the pioneering work done before Florence Nightingale, through to her all-important visionary efforts in the Crimea and in England, and how that led to nursing in the twentieth century, especially in the theatres of war between 1914-1918 and 1939-1945. While it emphasizes the British experience of nursing to some extent, it also traces parallel developments in the USA. Originally published in 1979 and long out-of-print, our new digital edition features an introduction by Yvonne McEwen, the official historian of the British Army Nursing Service.